The search for ancient Egypt's Queen Nefertiti in an alleged hidden chamber in King Tut's tomb has gained momentum. 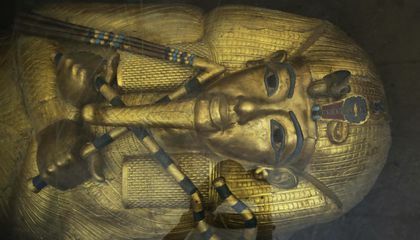 Egypt's antiquities minister said he is more convinced a queen's tomb may lay hidden behind King Tutankhamun's final resting place. While touring the burial sites of Tutankhamun and other pharaohs in Luxor's famed Valley of the Kings with British Egyptologist Nicholas Reeves, Minister Mamdouh el-Damaty said he thinks King Tut's 3,300-year-old pharaonic mausoleum probably contains at least one hidden chamber. Reeves theorized that Tutankhamun, popularly known as King Tut, who died at the age of 19, may have been rushed into an outer chamber of what was originally Nefertiti's tomb. "I agree with him that there's probably something behind the walls," el-Damaty said. But he said if anyone is buried there, it is likely Kia. She is believed by some Egyptologists to be King Tut's mother. High-resolution images of King Tut's tomb "revealed several very interesting features which look not at all natural, features like very, very straight lines which are 90 degrees to the ground. (They are) positioned so as to correspond with other features within the tomb," Reeves said Sept. 29 during the visit. These features would have been difficult to capture with the naked eye, he said. Reeves said the walls could conceal two unexplored doorways. One perhaps leads to Nefertiti's tomb. He also argues that the design of the tomb suggests it was built for a queen. 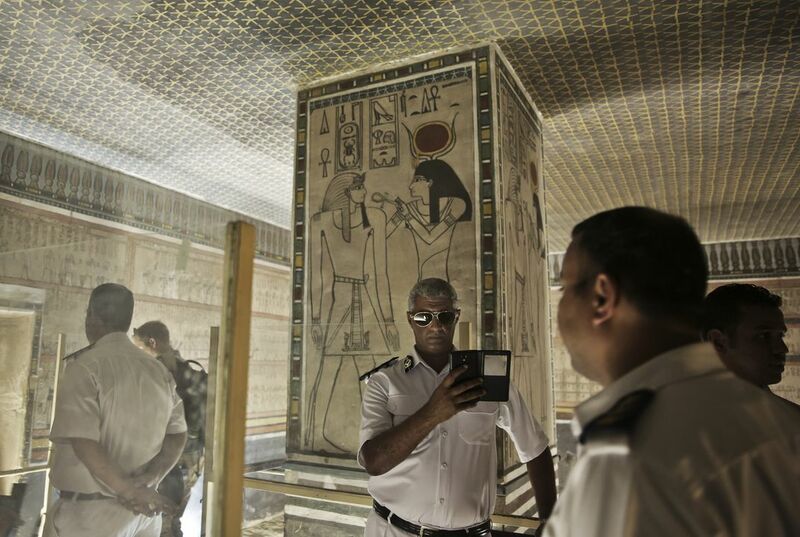 El-Damaty said he will seek final approval for a radar inspection of the tomb. Nefertiti is famed for her beauty and the subject of a famous 3,300-year-old bust. She was the primary wife of the Pharaoh Akhenaten. He tried and failed to switch Egypt to an early form of monotheism. That is the belief that there is only one God. Akhenaten was succeeded by a pharaoh referred to as Smenkhare and then Tut, who is widely believed to have been Akhenaten's son. "Nefertiti disappears ... according to the latest inscriptions just being found," said Reeves. "I think that Nefertiti didn't disappear. She simply changed her name." After Nefertiti died, Tut buried her. When he died, someone decided to extend the tomb, Reeves suggested. "Since Nefertiti had been buried a decade before, they remembered that tomb was there and they thought, well, perhaps we can extend it," he said. The 1922 discovery of Tutankhamun's tomb, filled with artifacts, including the famed golden funeral mask, made him known the world over. It boosted interest in that era. It is called the Amarna period. While inscriptions in tombs provide some information, they are not always helpful in clarifying a pharaoh's lineage. "In the case of royal tombs they're not dealing with mortal life. They're dealing with the beyond," said Reeves. He added that writing things such as the family tree "is just irrelevant." Instead, these inscriptions include things such as "spells to enable the deceased to reach the lands of the gods," said Reeves. This means Egyptologists use a number of factors to develop theories. Those lead to divisions among experts about the period. "Every Egyptologist has got a different view on the Amarna period. We have a lot of evidence to discuss but not just quite enough to make a final decision," said Reeves. "If we find something extra, even one small new inscription would be a great bonus, it could change everything," Reeves said. Tut, Nefertiti, and Akhenaten's family led Egypt during one of its most turbulent times. It ended with a military takeover by Egypt's top general, Horemheb. "Egypt basically fell apart under Akhenaten. It was the military that pulled it all together again," said Reeves, adding that Egyptians wiped out Tut's name from official records of pharaohs. Horemheb "made laws to control the country and to fight against the corruption, against the police who were corrupted, against the high officials," said Mohamed Saleh. He is a former director of the Egyptian Museum who was also touring the site. Tourism Minister Hesham Zazou said he hopes the new discovery will revive tourism in ancient Egyptian sites. Tourism at Red Sea beach resorts is rebounding after years of turmoil following the 2011 ouster of President Hosni Mubarak, said Zazou. But otherwise "tourism is suffering tremendously." Would you like to be a driverless car driver? Why did the ancient Egyptians use hidden chambers? How many tombs were down their in the cave? How many tombs were down their in the cave where Tut was? I agree with Minister Mamdouh el-Damaty saying King Tut's mausoleum probably contains at least one more secret chamber because of how King Tut was secretive. I think that it is interesting to know that Queen Nefertiti was known for her beauty too. I think that discovering King Tut's tomb is an important thing to have happened. I think it is interesting how people want to find her and how people would spend there whole life to try to find her. I find it very interesting that King Tut was "rushed into in an outer chamber". I can't believe that someone so famous today was supposedly rushed into a tomb that was meant for Queen Nefertiti. I think the Egyptians used hidden chambers because they didn't want tomb raiders or theives breaking in to the rooms and stealing the artifacts. For example, "...King Tut's 3,300-year-old pharaonic room mausoleum probably contains one hidden chamber." Egyptians also used traps to make sure robbers didn't steal artifacts. The Egyptologist might have been gotten one step closer on finding queen Nefertiti because Egyptologist had been close on trying to find queen Nefertiti in one of the hidden chambers that is in one of King Tut's tomb. Queen Nefertiti might have had a hidden tomb that is built for the queen itself because after queen Nefertiti had died, King Tut's tomb was at the outer chamber of queen Nefertiti's burial tomb. The Egyptologist might have been very close on trying to find queen Nefertiti's burial tomb because Egyptologist are trying to find the tomb for information for it. The tomb of queen Nefertiti is going to be hard for Egyptologist to find the tomb for Egyptologist to find that King Tut's tomb is at the outer layer of the tomb. Critical Thinking Question: Why did the ancient Egyptians use hidden chambers? Answer: Because ancient Egyptians used hidden chambers so that when grave robbers are trying to hunt down all of the treasures that the queen has because of her beauty, the ancient Egyptians had to use hidden chambers to keep away grave robbers.